Shhhhh! The surprise inside is caramel! 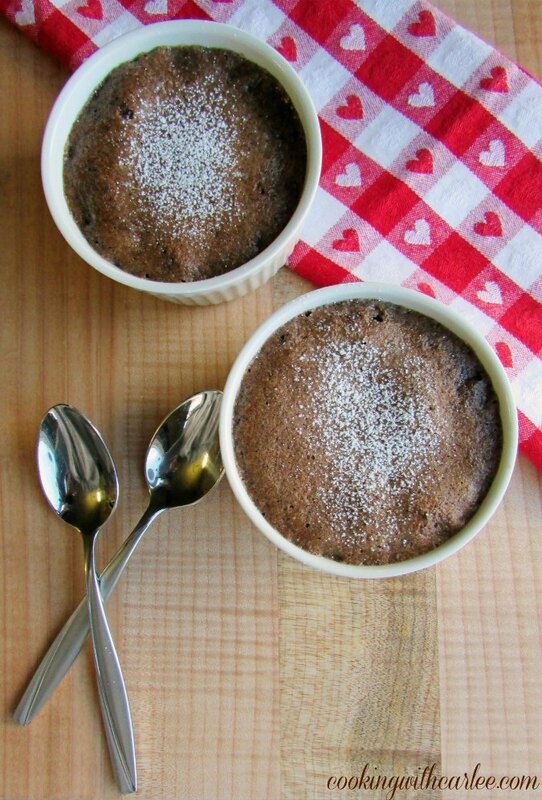 These fudgy baked puddings are decadent to be sure, but it won't stop you from licking the bowl clean. Go ahead, indulge! Mmmmmmm! Love is in the air and you know what that means? Chocolate, of course! Some may want fancy dinners, others may want flowers, but you can get me with chocolate every time. And you know what? 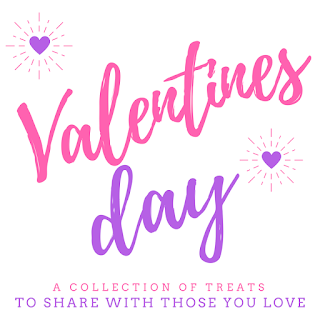 This is perfect if you are going it alone this Valentine's Day and want to treat yourself to a little something decadent too. Because a little chocolate is good for your soul, no matter what! As a matter a fact a quiet house to myself, wearing something nice and comfy while cozying up to one of these warm and gooey delights sounds like a pretty darn good evening. But, I digress. I am really not sure why we associate chocolate with love. I wouldn't be surprised if there is some historical significance and if you know it, please share. 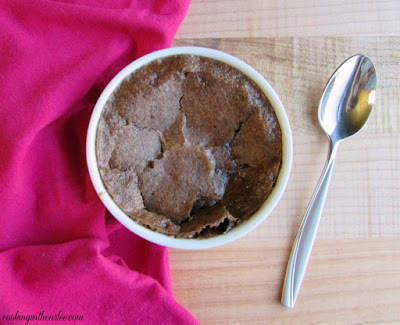 What I do know is that I love chocolate and if you show up with something as chocolaty and delicious as one of these baked puddings, you are going to have my heart. At least for a while. Once the chocolate is gone, I may have to reconsider. I guess I am just fickle like that. Now let me sell you on the beauty of these little gems. They come together quickly with a few turns of a whisk in a mixing bowl. Then the slowly come together in a water bath in the oven. As you crack through the thin crust that forms on top your spoon sinks into a sumptuous dark gooey chocolate of the best kind. Just when you think you have found yourself in a little bit of heaven, you discover that there are bits of caramel scattered here and there to round out the rich flavors and add just a bit of sticky chew. Mysteriously your spoon will keep going back for more until there is nothing left to scrape of the dish. A think a few pecan pieces scattered on the bottom would be a tasty addition too, if you are in to that sort of thing. My valentine would never go for such a thing though. Adding a nut to his dessert is a sure way to get him to stop and one bite and ruin his night. Unless they are almonds ground up beyond recognition and rolled into a rum ball, that's a different story. But just to be safe, he doesn't know they're in there either. Please don't tell him. He likes it in his bubble and there is no need to pop it! 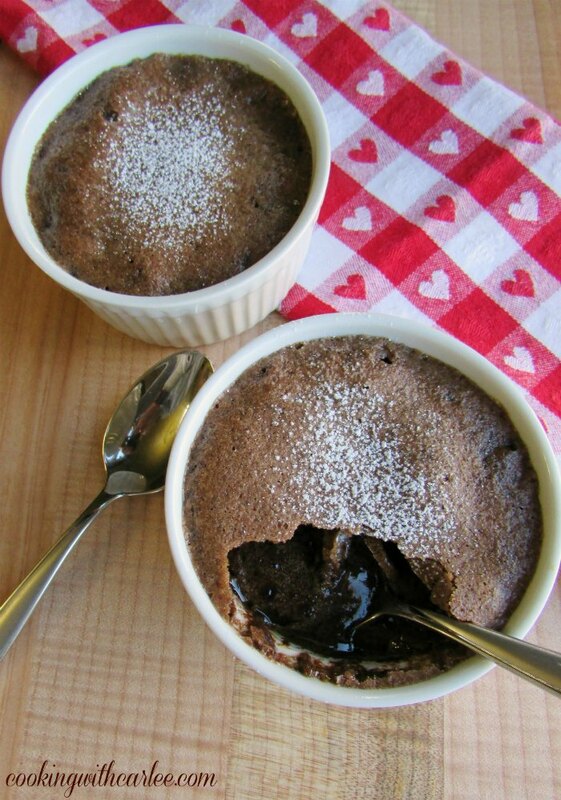 So make you and those you love a delicious dinner for Valentine's Day, but be sure to leave room for a little dessert. Each bite is sure to draw you deeper in love. Preheat oven to 325 F and fill a 9x13" pan with about an inch of water for a water bath. 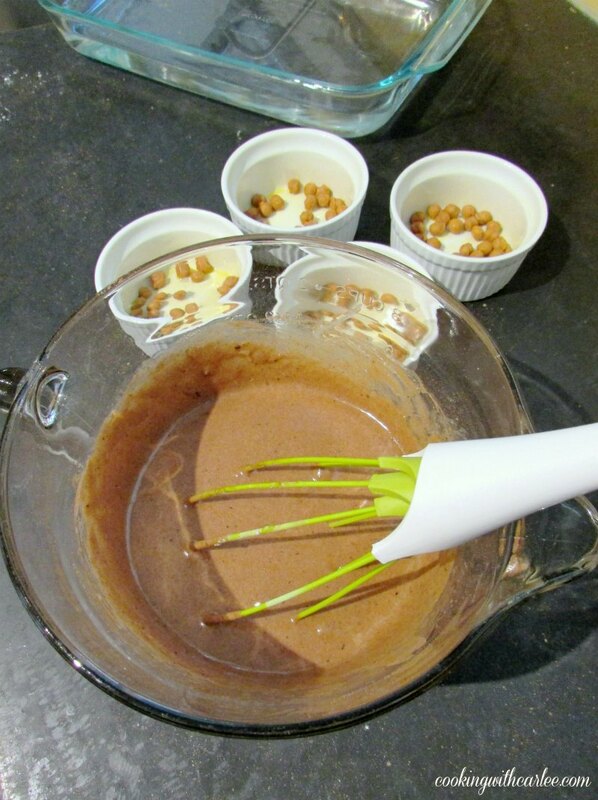 Grease 4 large ramekins and scatter 2 tablespoons of caramel bits in each. In a large bowl, beat eggs until light. Stir in sugar, cocoa, flour, melted butter and coffee granules. Mix until well incorporated. Spoon into prepared ramekins and gently place the ramekins in the water bath. Bake for 50 minutes to an hour. The top should have a nice crust and the inside should be loosely set but still gooey. Serve warm with a sprinkle of powdered sugar, a scoop of vanilla ice cream or a dollop of freshly whipped cream. If you are anything like me, you show affection through food. I love to cook for those I love. So do my friends! 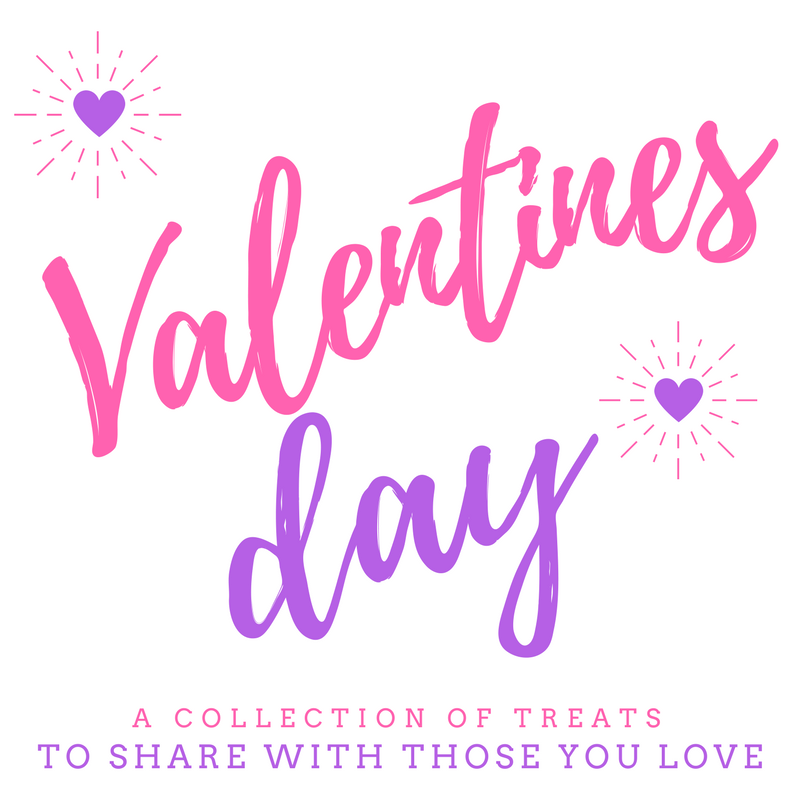 So we put together a collection of delicious recipes that will make those you love know just how much you care. Oh Carlee! I "LOVE" this! What a wonderful idea and that sweet surprise inside would have my tastebuds grinning!!! These sound absolutely amazing. Love the caramel surprise inside. These sound delicious and love the surprise inside! These looks absolutely divine, Carlee! I like the idea of nuts but my husband wouldn't go for that either. I guess that's the beauty of doing them as individual desserts, we could make some both ways! Hi Carlee, this looks and sounds so good. There is nothing like chocolate and a little surprise on Valentines Day! I will definitely be trying these! Thank you, Maureen! I hope you love them! You are probably right! I would love to be your partner in chocolate! Yummy! That looks so delicious! Caramel and chocolate is my favorite flavor combination. And I love any excuse to use my ramekins! I do too! Individual sized dishes are always so much fun! Thank you! Thanks for the reminder, I hopped on by! Mmmm! You are talking me into another batch... the only bad part is they don't last long! This dessert has my name written all of over it! I love that warm chocolate center! Thank you! Warm, gooey chocolate is my favorite kind! They really are! Thank you! Okay, so caramel hidden inside chocolate. Yes, please. (Dear husband: forget roses. I want THESE for Valentine's Day.) ;) Y-U-M. Stopping by from This Is How We Roll! I am with you... gooey chocolate beats roses every day!! Thank you so much! LOVE the caramel on the bottom! Hi Carlee, you are a lady after my own heart. Caramel and chocolate will always win me over, but only as long as the sweet treat lasts! I will have to improvise or make my own caramel bits, but this dessert is going to have to be tried, if the caramel and chocolate didn't sell it to me, then the idea of enjoying such a sweet treat curled up in front of the fire wearing comfy round the house clothes did! Do you have bigger caramels in the store? Maybe you could chop them? otherwise they would be delicious without as well. I wish we could do a sweet exchange, I could make you these and you could make the the chocolate, caramel and ice cream heart!!! Too bad neither would survive the trip very well! Oooh, these look amazing! You can't go wrong with anything chocolate, and I love the extra bit of caramel you threw in for good measure ;) Thanks for linking up with Merry Monday this week! It seemed like a bit of caramel couldn't hurt anything ;-) In fact, I could go for another right now! Thanks so much for stopping by! Pinned!! YUM! This sounds amazing! This would make a delightful treat. Thanks for sharing on Merry Monday. Pinned. It really is decadent and delicious, thank you so much! How timely is this yummy treat! Hopefully I can find the caramel bits here so I can make this real soon. Thank you for sharing the recipe. Have a fabulous week. Hopping over from Cooking and Crafting with J & J. Thank you, Ping! I hope you can find them. If not, a few chopped up caramels would do the trick! Your Chocolate Pudding looks delicious! Happy Valentine Day and thanks so much for sharing your awesome talent with us at Full Plate Thursday!